Since its discovery in 1933, Mapungubwe has fired the imagination of academics and members of the South African public alike. One of the golden objects – the Mapungubwe golden rhino – is a famous South African icon. The discovery flowed from the large finds of gold that were recovered from the burials excavated on the hilltop. Evidence shows that the success of the people of Mapungubwe was achieved against a backdrop of an environment seemingly marginal for human occupation. However, Mapungubwe even had connections with China, India and the Persian Gulf. This two-lecture course will explore the reasons for Mapungubwe’s rise. What was life like during the height of its power? Why did it collapse? What is the value of Mapungubwe today? The first lecture will focus on both the origins and the decline of Mapungubwe. It will also discuss the major archaeological finds from the site and how these have been interpreted. The second lecture will consider the place of Mapungubwe in modern South African society, and engage with issues related to the long term conservation of the site, including threats emanating from increasing mining in the area. 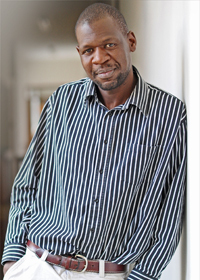 Dr Shadreck Chirikure is a Senior Lecturer in the Department of Archaeology at the University of Cape Town. He obtained the degrees of MA Artefact Studies (2002) and PhD in Archaeology (2005) from the Institute of Archaeology, University College London. His doctoral thesis explored the technology and socio-cultural metaphors associated with pre-colonial iron production in northern Zimbabwe. He was voted as one of the 200 Young South Africans by the Mail & Guardian for 2013 (read article here). Podcasts from his 2013 Summer School lecture series on Great Zimbabwe in the 21st Century are available on UCT Open Content.